Last June I wrote a post about the obscure film Where is Parsifal? ,which the BFI had listed as one of their 75 missing films. Directed by Henri Holman, the film was screened at the 1984 Cannes film festival and featured a stellar cast including Orson Welles, Peter Lawford, Tony Curtis, Donald Pleasance and Vladek Sheybal, but it was savaged by the few critics that saw it, probably due to its bizarre plot (something to do with the titular character (Curtis) inventing a laser skywriter and trying to sell the patent). My interest in the film stemmed from the involvement of Terence Young as executive producer. Young had been a promising film director at the start of his career and played a significant role in the success of the James Bond film franchise. Young was a friend of Bond creator Ian Fleming and directed three of the first four films in the series. He also groomed Sean Connery for the role as Bond. Sadly, the latter half of Young’s career is tainted by his involvement with bizarre and disastrous projects, such as Inchon (a Korean War movie financed by Unification Church founder Sun Myong Moon which is regarded as one of the worst films ever made) and allegedly The Long Days (1980), a propaganda film about Saddam Hussein which Young is said to have directed and edited for the Iraqi dictator. Young’s involvement with Where is Parsifal? may have also been dubious. 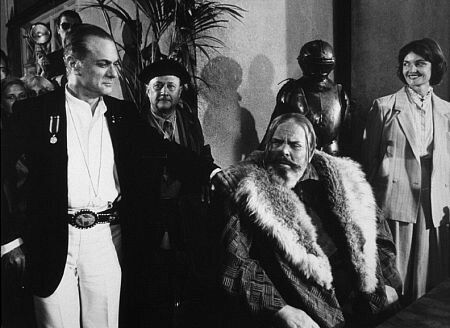 In an article for Psychotronic magazine, which examined the life and career of Vladek Sheybal, David Del Valle alleged that Welles only agreed to appear in the film as the producers had (falsely) promised to back his planned film adaptation of King Lear. Whether Young was party to this deception is not known. Anyway, I received a number of positive responses to the original post which made me wonder just how ‘lost’ the film was. One reader alerted me to this French news film available on YouTube which shows a clip from the film and Young and Curtis together at Cannes promoting it. My post was linked on the Italian Wikipedia page about the film which stated it was released on DVD in Italy in 2010 under the title There is Something Strange in the Family. Strange indeed! An Australian reader contacted me to say he had a VHS copy of the film. It was released on VHS in Australia in the 1980s apparently. Sure enough, I found this essay on the BFI website from November last year stating that they have removed Where is Parsifal? from their missing film list after Henri Holman donated his personal 35mm print. It’s wonderful news that they’ve finally tracked down a copy of this strange and elusive film for their archive, but as I discovered, there were quite a lot of copies in circulation for a missing film. It’s going to be a lot more difficult for the BFI to discover other older missing films such as The Mountain Eagle (1926): Alfred Hitchcok’s second film and the only film by Hitch regarded as lost. Still, anything’s possible. Thanks to all the readers who contacted me about the original post. Soooo… anybody seen it? Is it worth hunting for? Sounds a very interesting film indeed. I haven’t seen it yet, but it’s on my to do list. Everything I’ve heard about it suggests it’s not very good, but its historical value is significant. I’m the Australian guy mentioned in the article. Here’s my VHSRip – enjoy!